Nobody knows what it takes to get this far. Come listen to stories from three LGBT Judges and one member of the Commission on Judicial Nominee Evaluation (JNE) at BALIF/BASF’s annual Pathways to the Judiciary Event on February 23 from 5-7:30. 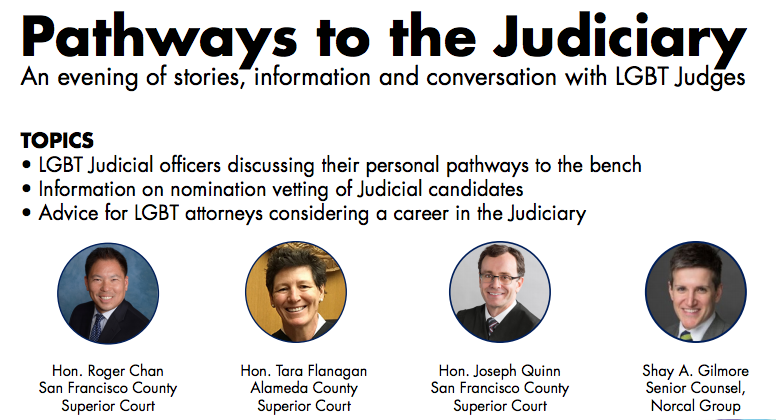 Learn how unique career paths lead these judges to the bench. Learn the process of nomination evaluations from a JNE member. The program is eligible for 1.5 hours of Elimination of Bias MCLE Credit. Program: 5:30 - 7:30 p.m.
BALIF Members please call 415-982-1600 to receive your member discount on registration.